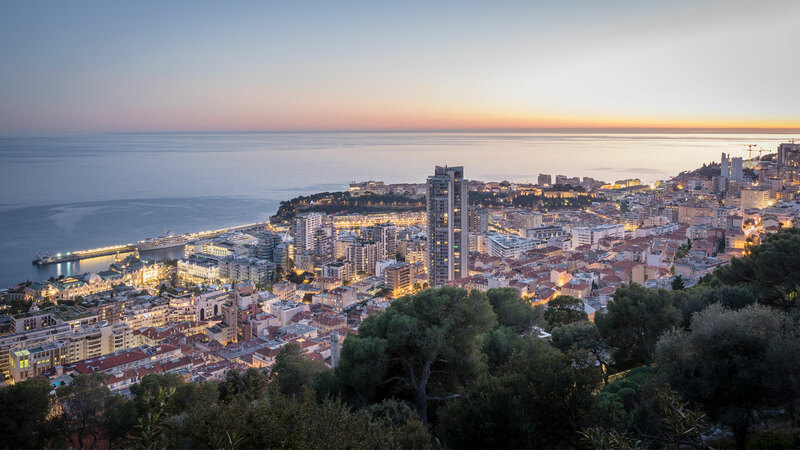 The tallest building in Monaco is the Tour Odéon, whose inauguration in 2015 was accompanied by a great deal of media attention focused on the level of luxury it offers residents. The double skyscraper soars 170 metres above the peaceful Saint-Roman residential district. It houses 60 serviced apartments, duplexes and a penthouse. In addition to the lavish interiors, residents benefit from a chauffered limousine and numerous other services and have use of the magnificent spa and a business centre. Monaco’s skyline has changed dramatically in the past few decades. In 1954, the Principality was home to 688 villas but the success of the Monaco Economic Development Corporation, established by Prince Rainier III in 1960, led to an influx of new workers and investors who needed accommodation. Many villas were demolished to make way for apartment buildings and hotels. In this tiny country, building upwards was the logical solution. Before the 170-metre-tall blue glass-clad Tour Odéon appeared on Monaco’s skyline, the Millefiori was the tallest apartment building. Completed in 1969, it rises 111 metres above the Monte Carlo district, offering residents spectacular views and proximity to the Carré d’Or shopping area and some of Monaco’s most famous landmarks. Many of the luxury apartments have undergone renovation work and a supermarket sits conveniently at street level. L’Annonciade, close to the Tour Odéon in the La Rousse-Saint Roman district, also stands at 111 metres. It opened its doors in 1980. La Rousse-Saint Roman properties are close to a public elevator that takes residents down to the beaches in Larvotto. Parc Saint-Roman is the third tallest building. This 35-floor building rises 108 metres and was completed two years after L’Annonciade. Chateau Perigord I and II, completed in 1972 and 1973 respectively, rise to 93 metres. Luxury apartments in these portered buildings in La Rousse-Saint Roman are highly sought after. In 2011, the slender 90-metre-tall towers and geometric facades of the Résidence Le Simona made their appearance in the Principality. Le Simona is the ninth tallest building in Monaco, a position it shares with Le Roccabella in the Larvotto district. Like the Tour Odeon, Le Simona has brought Monaco into a new era with its combination of innovative modern architecture and a luxurious living environment. Monaco’s skyline has changed dramatically in the past few decades.